Art Instruction Can Be Therapeutic! 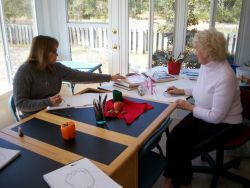 What I have learned after over thirty years of art teaching, is that art is therapeutic for many students. The application is generally as follows: A person will come to one of my art classes with the hope of relieving the creative hunger they have had for years. There is almost always a reason why the hunger was there originally and why it was delayed or squelched. Many times, unfortunately, it is an instructor who, by some condemning words, cause the person to give up entirely on any creative endeavor. And yet, the desire lived on within them. Many times, over a period of twenty or thirty years, that repression has continually existed and the person has regularly been frustrated by the urge to create and the brick wall that was built in front of that urge many years ago. I can honestly say that at least forty percent of my students relate some incident or experience with a teacher or instructor that has destroyed their creative abilities that were burgeoning at the time. Then, there is the smaller percentage of students that give accounts of being discouraged or harshly criticized by a parent, sibling or relative for doing something creative--this could range from drawing, painting, creating a play, experimenting with cooking or even building a play house. I have written basic lessons to address this problem, designing exercises that teach skill and technique, but are also fun and not intimidating. When students successful complete an art skill, they have developed some confidence and feel good about what they have accomplished. Although I also encourage students, I find that when they develop a specific ability to create something, for example, learning how to shade a circle so that it looks like a sphere, the achievement alone is the best reward for the student. As new skills are learned, students develop more confidence in their creative abilities. 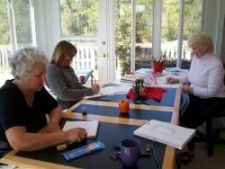 Learning skills demand time and effort from the student, but the payoff is always mastering the skill and coming away with a drawing, painting, collage or water color that is suitable for framing. Slowly, more exercises are introduced, building on the skills that the student now knows and combining that with a new skill. My classes are small and I can guide each student individually. This is a definite advantage, as I have found it larger classes, personal guidance is difficult and many students slow down and sometimes get stalled doing an exercise. Years ago, I was assisting an art instructor at a museum school. 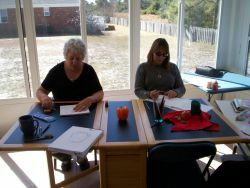 The instructor would set up a large and complicated still life of many different objects (fruit, potted plants, books, umbrellas, a coat rack, etc.) He then told the students to draw it and left the room until near the end of the class, he would appear again and begin to critique (analyze) each students work. Often his criticisms were harsh and his recommendations to correct the student's mistakes were brief and not very clear. I could see that a lot of the students were becoming discouraged and attendance diminished to three or four stalwart students. The instructor attributed this dropout rate to the students' inability to grasp what art entailed. I personally felt the whole instructional methods employed my the instructor was at fault, and if he had taken time to guide each student during the session instead of leaving the room, not only would attendance remain the same, but the students would have actually learned something. When I started to instruct art classes, I limited the number of students that could attend so that I could deal with each student individually. I constructed exercises that were easy to begin with and that would lead to an ever increasing knowledge and mastery of the subject (drawing, painting, collage, printmaking, etc.) To this day, every lesson offered in Free Online Art Classes is constructed around the philosophy that every student is encouraged to create, learn the basic and develop their skills gradually. I find that this method, over thirty years, has worked quite well. What I also have learned over the years is that not only is the dialogue between myself as instructor and the student is important, but dialogues between the students are important, also. For example, It has often occurred that there is one or two student is a class that verbalize their apprehensions to learning to create anything. In a drawing class, a student might say out loud, "Oh, I just can't do this! I just don't have it, I guess. I'm not an artist. This is too hard." When the other students hear this, they are affected in a negative way and they might also begin to doubt that they can do an exercise successfully. Read my recent article on" How Dreaming Can Be An Asset To Enriching Your Life"
So, on the first day of the class, I talk to the students about how their brain is split into two hemispheres: the right and the left, and how, especially early in the learning process, there can be a conflict between these two hemispheres. Often the left hemisphere, which seeks to define, chart and explain phenomena, is not comfortable with the creative process, which relies not on definition or explanation, but seeing and reiterating what is seen. A great and seminal book written on this problem is Betty Edwards' "Drawing On The Right Side Of Your Brain." Once students are aware of this conflict between their two hemispheres, they can control it by choosing to not accept a left brain feeling of "It's a book! Why have to draw it! I KNOW what it is!" and going into the right brain mode of looking carefully at the subject matter and applying the draw-what-I see technique. It becomes often a source of amusement as students experience the push/pull between their two hemispheres. Often, a student will say to another student, "Hey, I hear you groaning. Come on, get into the right side and have fun!" Or, "I can feel there is a kind of wrestling match going on inside my head." There is no doubt in my mind that students who come away from a class feeling encouraged and even elated by their own learning process and artistic endeavors will return to the next session with not only, successfully produced exercises, but a positive attitude. I do consider this a good therapeutic alternative to what was a degrading, frustrating and negative experience in the art museum instructor's class years ago. I made the choice to write all of my courses to be not only information-rich, but easily accessible and workable for every student. Students learn differently, some will be slow at grasping a skill or concept, others will speed right along, successfully completing an exercise and moving on to the next. I am there for all of them--to encourage and guide. I demonstrate skills and techniques when necessary, so students can more quickly grasp what it is they have to do. I work with slower students, encouraging their efforts and I give faster-moving students exercises that will help develop their learning skills further. In this way, art-learning becomes more than a skill to be learned, but a way of enrichment or perception and visual awareness that sensitizes us towards to beautiful and wonderful things our world has to offer.